Cooking, cooking, cooking . . . we're doing lots of cooking! Well, let's rewind to Friday night. Around five in the evening, the tornado sirens went off. So, off to the basement we all went. Since the weather wasn't bad where we were, we didn't expect an actual tornado to come through. So we pulled out our pillows and stash of books and read away for about an hour when the sirens stopped. Now, let's fast-forward to Sunday morning. Our oldest daughter went to the basement to get something out of the freezer. The pillows were still on the floor. In typical seven-year-old fashion, our daughter grabbed what she needed, then turned and let the door close behind her . . . not checking that it actually closed. Do you see where this is going? Several hours later, my hubby went down to pull out some stuff for dinner. Instead, he discovered the freezer door stuck on one of the pillows, with a huge puddle of water surrounding it. Upon closer inspection, he also discovered all of our meat (which we just stocked up on) was well on its way in the defrosting stage. We spent most of Sunday night cutting and cooking seven pounds of chicken. We made two BBQ Chicken Sandwiches meals, then bagged them and refroze. We also cut up a bunch to make Teriyaki Chicken. It marinated over night. Today, I'm frying up the Teriyaki - two dinners worth. Also, hamburger for tacos and spaghetti sauce. I'm going to cube up some steak for beef stew. I also need to figure out what to do with the rest of the chicken and pork chops. And I need to get it all figured out by the end of tonight - or at least that's what my butcher recommended. And I totally trust him. So tonight is the deadline for having everything cooked, packaged, and back into the freezer. I did get a little break from the stove this morning. I took a bunch of stuff over to the Kids Closet Consignment Sale. For anyone living near Olathe, the sale is Sept. 16-19th in Lenexa at the Cedar Ridge Christian Church (8835 Lackman Rd.). For more info, click here. I'm also going to participate in the Kids Closet Gardner sale in October. On the way home from dropping stuff off, my friend Michelle and I were talking in the van. Picture this - I'm on the corner of Lackman Dr & 87th St, stopped at a red light. There are two cars in front of me. One turned right onto 87th (we were on Lackman), which left one car in front of me. This car wanted to go straight through the intersection. I needed to turn right. There's no turning lane, so I'm sitting behind this car, talking to my friend, waiting for the light. Got it? Finally the light turned green and traffic moves on. I turned right onto 87th and the next light we approached turned red. Well, this van pulls up next to me and stops. The driver (an older man with gray hair & beard) still has room to move forward, but is motioning to me to put the window down. I'm thinking, Did something get stuck in the trunk and is hanging out? So, I put my window down a little, and he says . . .
"Are you from out of state?" I look at my friend, like What? Then turn to the man and say, "Excuse me?" "You must be from out of state, because you were too stupid to know you can turn right when the light is red." Co-incidentally, the light turned green and he drove on. I, on the other hand, sat there with my mouth hanging open. And what do I see on the back of his van? Hmm . . . Let's see. We were in Kansas. I have a Kansas license plate. 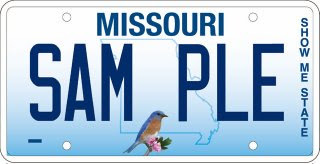 He has a Missouri license plate. Who's from out of state? Apparently, he must have failed geography since he couldn't tell the difference between Kansas and Missouri. Also, his eyesight must be going because anyone with good vision would be able to see that you can't drive through another car. After ranting to Michelle for a few minutes, I started to wonder . . . What kind of a person goes through life with such anger built up that something so in-consequential as waiting to turn at a red light, makes him actually take the time to stop, get another driver's attention, just to say something so completely stupid. A normal person would just shrug his shoulders and move on. And then, I pitied the poor guy. I'd hate to live with so much negative emotion. This is a guy who seriously needs to learn the value of prayer and forgiveness and get rid of all that heavy weight that must be sitting on his shoulders. Well, that's a bit of what's happening here. I hope your Mondays are wonderful. I know I'm personally looking forward to Family Home Evening tonight. I have some fun stuff planned for our family . . . hee hee hee! Happy Monday, everyone! I guess after today you won't have much cooking to do! That will be a nice break :o) I can't believe that guy called you stupid! I'm not the best driver, and so I'm sure I've ticked off lots of people. I always just think to myself, "They'll get over it in a couple minutes." But I guess maybe some won't. Hope your FHE is fun! The funny thing is that after cooking all day, nothing looks good for dinner & I don't want to cook anything else, either. Oh well. Guess we'll have to eat out. Oh, the irony. But John will love the meals when I'm out of town! I'm glad you didn't let Missouri ruin your day. My son likes to say, Missouri, the state I'm in. Sound's kind of like it fits that guy. Makes you wonder if somebody left his freezer door open. Thanks, Cathy. You always make me smile!